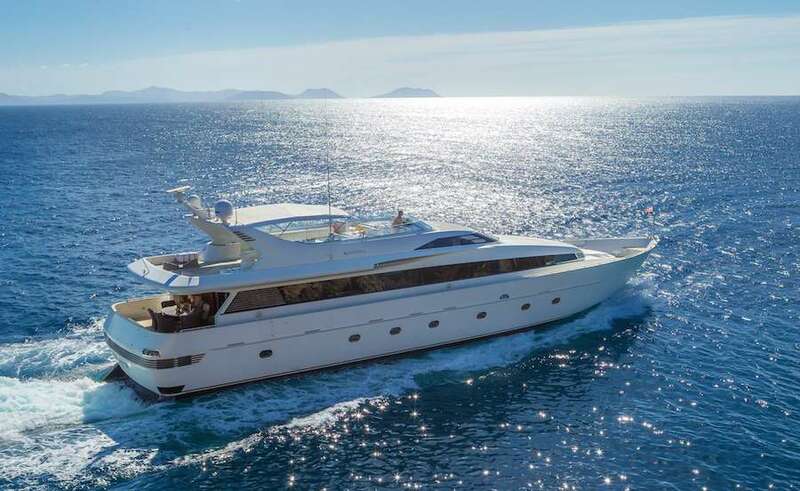 MARVI DE is a 30.50m (100' 1") luxury motor yacht built by Admiral in 1999 and refitted in 2018. 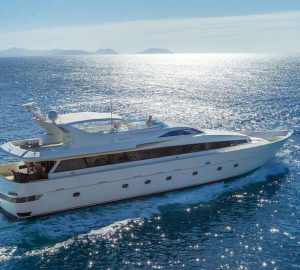 With elegant, classical styled and luxurious interiors, as well as fabulous deck areas, she can accommodate up to 10 charter guests over a 5-cabin layout, while her crew of 6 ensures everyone has an amazing charter vacation. 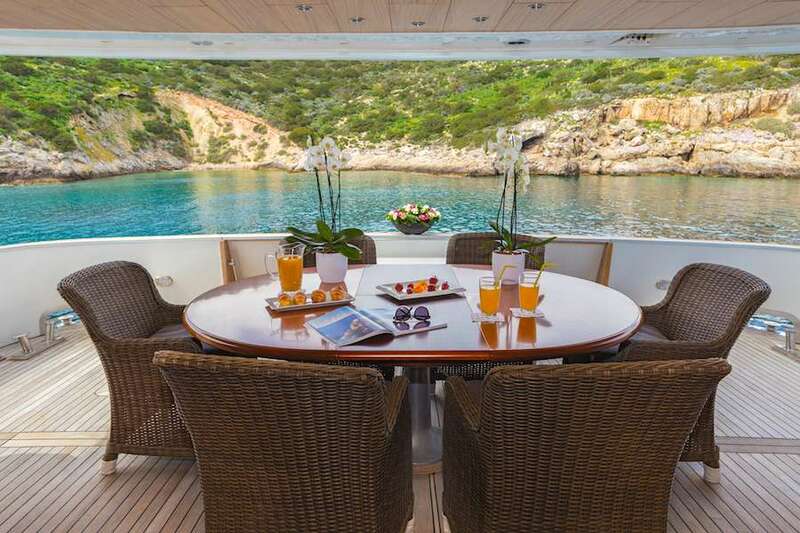 The main deck aft has a large circular alfresco dining table to seat six guests, with the flybridge overhang providing plenty of shade. 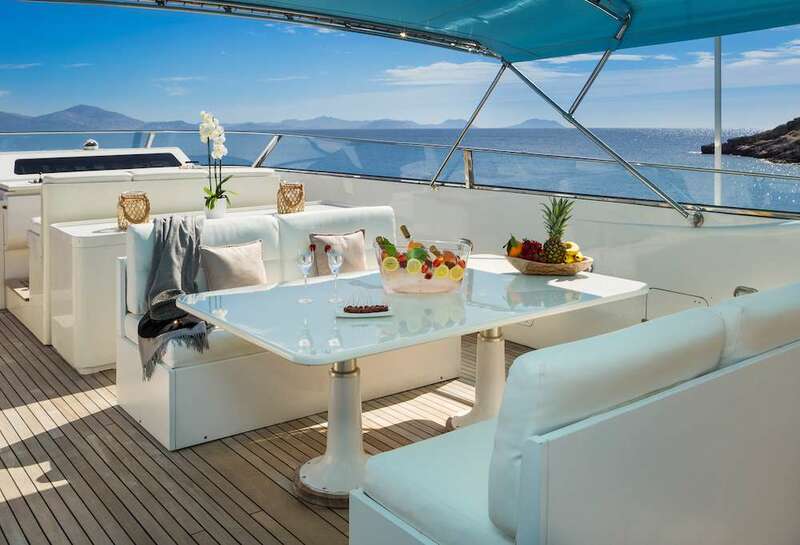 The foredeck is furnished with two broad sunpads in front of the raised pilothouse, where guests can take in panoramic forward views. The flybridge has wonderful elevated views and guests can sunbathe along the stern when the tender has been launched by Davit crane. Amidships to starboard, an elevated dining table is placed between two large sofas, and forward there is the helm controls and additional seating to port. 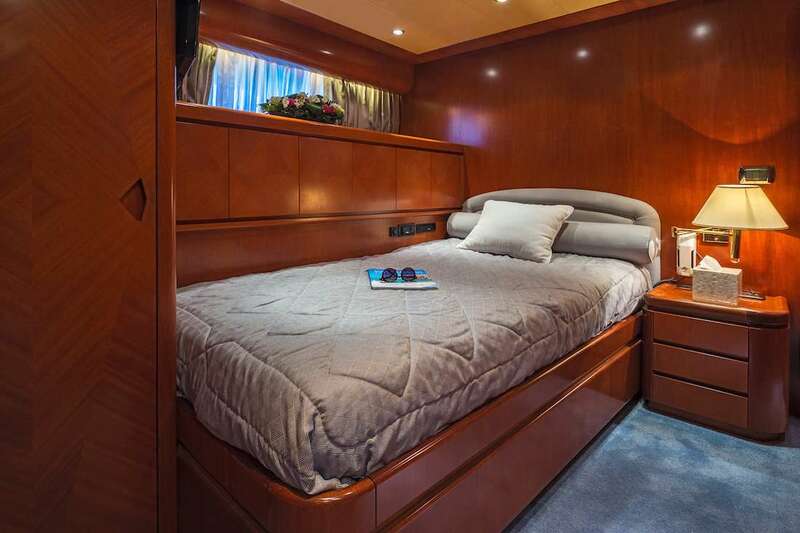 The beautiful timeless interiors use traditional wooden panelling, broad windows and contemporary touches in the artwork and accessories that make M/Y MARVI DE suited to events and special occasions as well as family holidays. The lower deck hosts the guest and crew accommodation, leaving the main deck free for shared guest spaces. 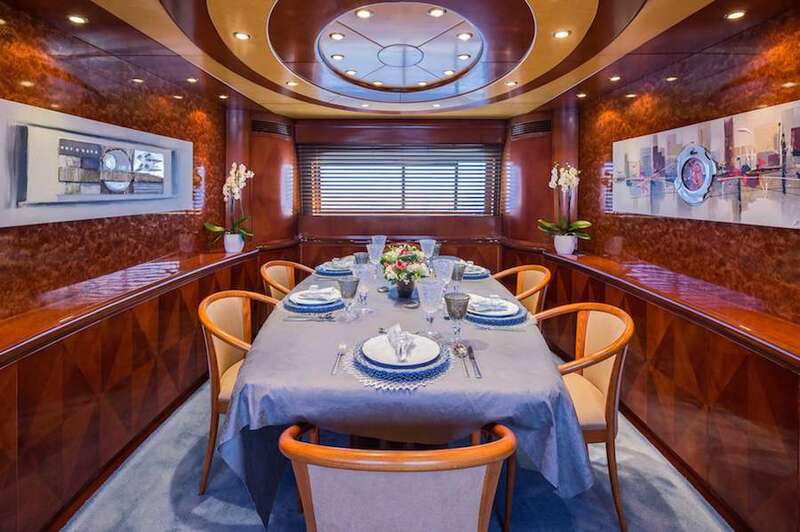 The main deck places the Master suite forward with the main foyer and galley immediately behind. The separate formal dining room has port and starboard windows, and a fresh pale interior colour scheme to contrast with the deep wooden panelling. 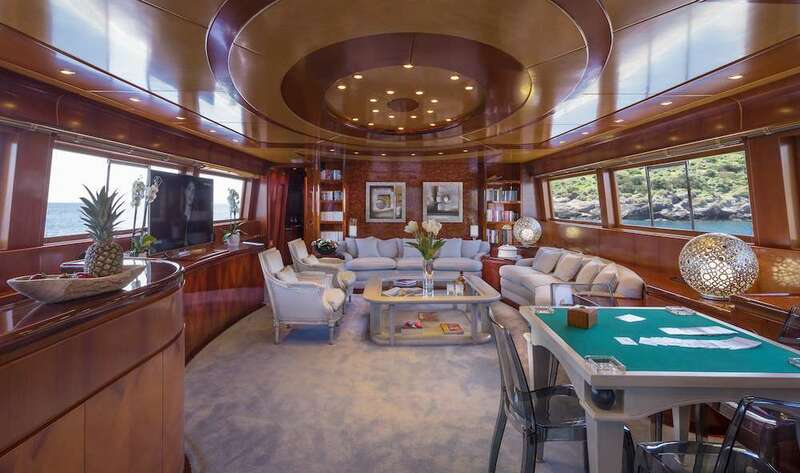 The main salon places a plush sofa along the forward sofa and a second sofa to starboard. Two armchairs are also placed around the central coffee table and opposite there is a TV on the cabinetry opposite. Farther aft, there is a games table and a bar opposite. Twin TE 396 MTU engines each producing 2,300 HP produce a maximum speed of 28 knots and a cruising speed of 22 knots. 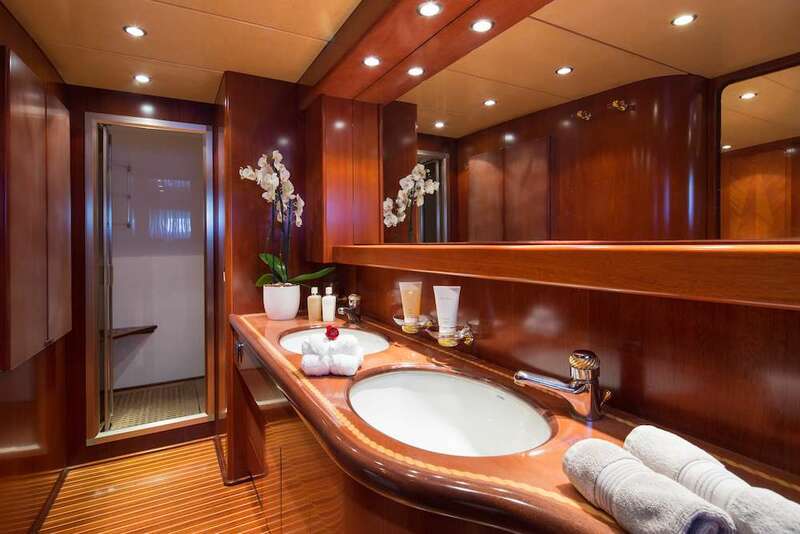 Accommodation on board in includes 5 cabins for up to 10 charter guests, all offering private ensuite bathroom facilities and luxury amenities. The cabins comprise on master suite with a walk-around bed, walk-in closet, a sofa for two, storage space and the ensuite bathroom with two sinks and shower. 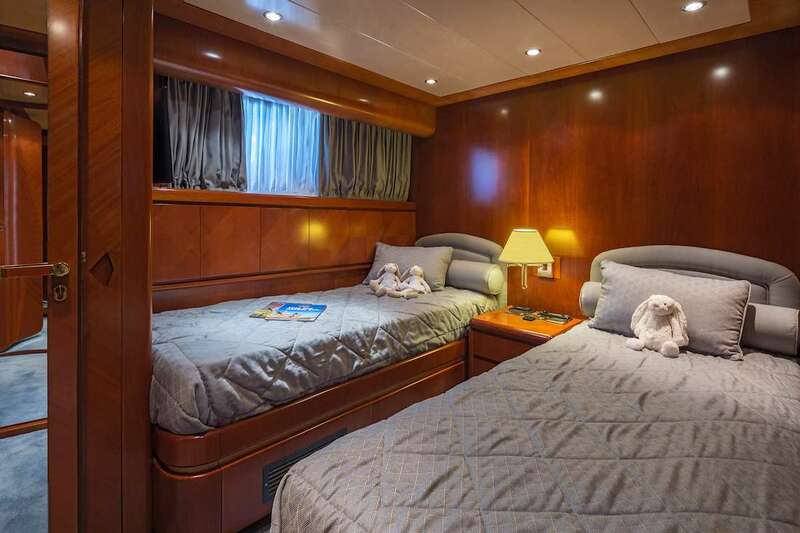 The VIP cabin has a double bed, while there are additional two twin cabins with two singed beds in each, plus one guest cabin with semi-double bed. There is also an additional day head on the main deck. Crew of six is accommodated in separate crew facilities with ensuite bathrooms.